Today 22nd Jan 2010, Friday is a very auspicious day – Ratha Sapthami – signifying the seventh day of Shukla Paksha of thai matham. Uttarayana is the six month period between Makara sankranti (Jan 14) and July 14 when Sun travels towards North in the celestial sphere. Ratha saptami marks the seventhday following the Sun’s northerly movement of vernal equinox starting from Capricorn (Makara). 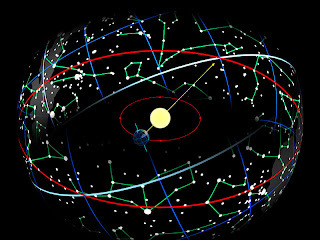 A journey from makara rekai to kadaka rekai – Capricorn to Cancer. 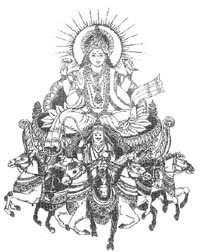 Today symbolically represents the Sun God Surya turning his Ratha (chariot) drawn by seven horses towards northern hemisphere in a north-easterly direction. Today is also celebrated as the birth of Surya sage Kashyapa and his wife Aditi and celebrated as Surya Jayanthi in many parts. It is also said that sage Bhisma breathed his last breath a day after the Rathasaptahmi day. From today, the days get warmer, especially in South India. This is an important annual festival at Vaishnavaite temples including Thiruvarangam & Thirumala. Today, it was celebrated grandly in Thiruvallikkeni also. Early morning, Sri Parthasarathi Emperuman had decorated purappadu on Surya prabhai. Sun worship is deep rooted in vedas and its antiquity relates to several mythologies. Mythologically, the seven horses of the chariot represent the days of a week, the 12 wheels represent 12 signs each of 30 degrees and constitutes a full year named samvatsara. The Sun’s own house is Leo (Simha) and he moves from one house to other every month and the total cycle takes 365 days to complete. The Ratha saptami festival seeks the benevolent cosmic spread of energy and light from the Sun God. Om. udvayaM tamasaspari jyotiSpashyanta uttaram.